This is another request from my Pokemon-obsessed Etsy customer. He had taken a break from Pokemon to focus on other games but has returned with a list of Pokemon that he would like to have done. This is the first on that list. This pattern includes the color lists for both Pidgeot and Shiny Pidgeot. Worsted Weight Yarn (Shiny colors in parenthesis): Buff (pale yellow), café latte, black, white, peach (orange), shocking pink (orange), and golden yellow (pale yellow). Finish off leaving a long tail. Weave tail through sc of Rd 40, pull tightly and secure. Weave in ends. Finish off leaving a long tail. Sew HEAD AND NECK to BODY stuffing before closing. Weave in ends. Finish off leaving a long tail. Sew HOOD AND BACK to BODY. Weave in ends. Finish off leaving a long tail. Sew SIDEBURNS to BODY. Finish off in first BEAK HALF and not the second. Rd 4: holding BEAK HALVES together and working through both thicknesses, ch 1, turn; sc in next 2 sc, hdc in next sc, (hdc, dc) in next sc, (dc, hdc) in next sc, hdc in next sc, sc in next 2 sc. Finish off leaving a long tail. Sew BEAK to BODY stuffing before closing. Using black and white, embroider EYES on PIDGEOT. Rds 3-4: sc in each sc around. (6) Change to peach. Finish off. Weave in ends. Stuff LARGE TALONS firmly. Finish off. Weave in ends. Stuff SMALL TALONS firmly. Rd 4: sc together next sc on LEGS and next unworked sc on LARGE TALONS, (working behind same LARGE TALONS, sc in next sc, ch 1, sc in next sc, skip next 5 sc on same LARGE TALONS, sc together next sc on LARGE TALONS and next unworked sc of next LARGE TALONS) twice, working behind same LARGE TALONS, sc in next sc, ch 1, sc in next sc, skip next 5 sc on same LARGE TALONS, sc together next sc on LARGE TALONS and next sc on LEGS, sc together next sc on LEGS and next unworked sc on SMALL TALONS, working behind same SMALL TALONS, sc in next sc, ch 1, sc in next sc, skip next 5 sc on same SMALL TALONS, sc together next sc on SMALL TALONS and next sc on LEGS. Rd 5: sc together next sc on LEGS and next unworked sc on LARGE TALONS, (working behind same LARGE TALONS, sc in next sc, ch 1, sc in next sc, skip next 3 sc on same LARGE TALONS, sc together next sc on LARGE TALONS and next sc on LEGS and next unworked sc of next LARGE TALONS) twice, working behind same LARGE TALONS, sc in next sc, ch 1, sc in next sc, skip next 3 sc on same LARGE TALONS, sc together next sc on LARGE TALONS and next sc on LEGS, sc together next sc on LEGS and next unworked sc on SMALL TALONS, working behind same SMALL TALONS, sc in next sc, ch 1, sc in next sc, skip next 3 sc on same SMALL TALONS, sc together next sc on SMALL TALONS and next sc on LEGS. Rds 7-9: sc in each sc around. (12) Change to buff after Rd 9. Finish off leaving a long tail. Sew TAIL FEATHER together and then to BODY. Rw 1: Ch 21, sc in second ch from hook, sc in next ch, hdc in next 2 ch, dc in next 16 ch, skip next 2 sc, slip st in next sc. Rw 1: Attach golden yellow in next sc, ch 21, sc in second ch from hook, sc in next ch, hdc in next 2 ch, dc in next 16 ch, skip next sc, slip st in next sc. Rws 2-4: Ch 21, sc in second ch from hook, sc in next ch, hdc in next 2 ch, dc in next 4 ch, working over ch in dc of previous Rw, dc in next 12 dc, skip next sc, slip st in next sc. Rw 1: Attach shocking pink in next sc, ch 21, sc in second ch from hook, sc in next ch, hdc in next 2 ch, dc in next 16 ch, skip next sc, slip st in next sc. Finish off. Weave in ends. Sew HEAD FEATHERS to BODY. BEGIN STUFFING WINGS LIGHTLY. CONTINUE STUFFING WINGS LIGHTLY AS YOU GO ALONG. Finish off leaving a long tail. Weave tail through sc of Rd 33, pull tightly and secure. Using buff, embroider dividing lines on café latte section of WINGS. Using black, embroider dividing lines on buff section of WINGS. 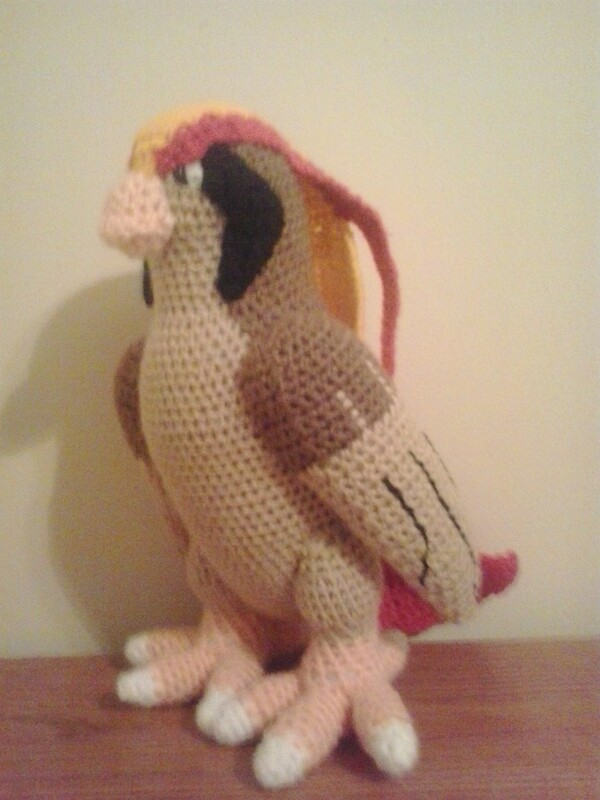 Sew WINGS to PIDGEOT. Pidgeot, Shiny Pidgeot and Pokemon are copyright Nintendo and their respective creators. This pattern is an original pattern © by Christjan Bee (June 2018). Please do not claim this pattern as your own. If you wish to share this pattern, you may link to this pattern but please do not reprint it on your site. You may keep a copy for your own personal use, but you may not sell or distribute it, or sell items made from this pattern.